Monty Alexander; Jamaican Reggae 'Ridim' Section; The Gumption Band; USA Jazz Rhythm Section. FIM LIM UHD 0770 LE. 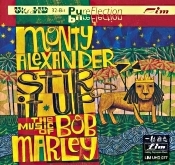 On this remastered FIM/LIM (First Impression Music/Lasting Impression Music) audiophile disc, Monty Alexander plays the music of Bob Marley. What do you mean, Who's Monty Alexander? Well, at least you recognize Bob Marley. 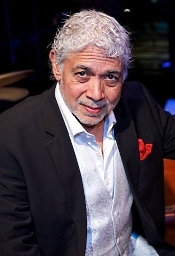 Let me go back into my old teacher mode again and annoy those of you already in the know: Monty Alexander is a Jamaican-born jazz pianist who has been performing for some fifty-odd years. Bob Marley, of course, is the Jamaican-born King of Reggae, who in his relatively short lifetime became an internationally famous singer, songwriter, and guitarist. What I didn't know about either artist is that they were both born in Jamaica within a year apart, and that while Marley became a superstar with some fifteen albums to his credit, Alexander has been performing longer and recorded over five times as many albums (seventy-six of them since 1969). The Alexander album under review originally appeared in 1999 under the Telarc label, and the folks at FIM just recently remastered it. On the album, Alexander does jazz interpretations of a dozen of Marley's most-familiar tunes. OK, but probably the first questions that come to one's mind are Why, and who will it please? Marley fans may not want somebody else tinkering with their favorite music, and Alexander fans may not want the jazz man messing around in Jamaican reggae. Fortunately, all is well. Most of this jazz-reggae fusion comes off pretty nicely, even if it isn't the best of either world. Personally, I'd still rather hear Marley done by Marley. Nevertheless, jazz is jazz, and Alexander's laid-back, straight-ahead, easy-listening jazz style falls sweetly on the ear. The fact that Alexander's renditions of Marley may appeal more to Alexander's fans (or jazz fans in general) than to Marley's fans (or reggae fans in general) we'll just have to leave alone. The music on the album is what it is: essentially jazz. Understand that going in. A number of fine musicians back up Alexander in the rhythm section, including Dwight Dawes, keyboards; Robert Angus, guitar; Trevor Mckenzie, bass; Glen Browne, bass; Rolando Wilson, drums; Desmond Jones, percussion; Derek DiCenzo, guitar; Hassan J.J. Wiggins, bass; Troy Davis, drums; and guest artists Steve Turre, trombone and conch shell, and Sly Dunbar on "Could You Be Loved." Be aware, though, there is no singing involved. Alexander is a jazz pianist, and he's the star of the show. While not having Marley's words may disappoint his followers, Alexander's pianism at least partly makes up for it. These are not mere cover items, after all, but jazz renditions of Marley's work. The twelve songs on the album are "So Jah She," "Nesta (He Touched the Sky)," "Jammin," "Crisis,"
"Could You Be Loved," "The Heathen," "No Woman No Cry," "Running Away," "Is This LOVE?," "Stir It Up," "Kaya," and "I Shot the Sheriff." Incidentally, the "Could You Be Loved" track is the extended remix featuring Sly Dunbar, while the album omits the regular version of the song. We find two good fusions on the album. First, there's obviously the fusion jazz and reggae, which Alexander executes with a mellifluent sense of improvisation while maintaining a semblance of reggae beat. Second, there's the fusion of Alexander's piano and the players around him, whose interplay of instruments is delightful throughout the program. Favorites? Sure. I enjoyed "Nesta" for its mournful yet uplifting spirit; "Jammin" and "Could You Be Loved" for their full-ahead jamming jazz style; "Crisis" for its oddly reassuring, calming influence; and "Is This LOVE?" "Kaya," and "Stir It Up" for their more-obvious Jamaican jazz influences. Finally, let me remind potential buyers again that this is primarily a jazz album, not a reggae album, and Bob Marley's music is simply a starting point for Monty Alexander's own riffs, rhythms, and free forms. As such, it works fine. But if you want Marley, buy Marley. And, yeah, there are a couple of selections I found a little too syrupy for my taste, neither very jazzy nor very reggae. Yet even these are relaxing and easy on the ears, and for this reason may even appeal to wider audience than the other tracks on the disc. Producers Glen Browne and Robert Woods and engineers Jack Renner and Robert Friedrich recorded the music in October 1998 for Telarc Records at Avatar Studio, Studio A, New York City. FIM producer Winston Ma and Five/Four Productions engineer Robert Friedrich remastered the album in 2014 for FIM/LIM using the 32-bit Ultra High Definition mastering format and PureFlection processing. One hears a very quick transient response, with crisp articulation throughout the set. Also, there is the expected good bass and treble response, with deep, tight lows and extended highs. The stereo spread is not quite as wide as on most pop recordings but remains more realistically centered just in from the left and right speakers. Then, there's a nice midrange transparency and an overall smoothness that's hard not to like. It's a realistic presentation and one worthy of FIM's audiophile remastering; whether it's worth the extra money over the standard Telarc issue may depend on how much you already like the album or how much in terms of price the absolute best sound means to you. Like other FIM/LIM products, this one comes packaged in a glossy hardcover book format, with notes and pictures bound to the inside and the disc housed in a static-proof inner liner, further enclosed in a fastened paper sleeve. Also, Four Motets; Barber: Reincarnations and other works. Sally Bruce-Payne, mezzo-soprano; Ben Parry, Dunedin Consort. Linn Records BKD 117. 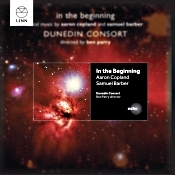 You're probably wondering what the Dunedin Consort, a Baroque choral and instrumental ensemble based in Edinburgh, Scotland, is doing singing the music of two twentieth-century American composers, Copland and Barber. Good question. The way the program notes describe the situation: "Both Copland and Barber, in their settings for unaccompanied chorus, had an instinctive feel for the human voice, a natural gift for word setting, and a pure style of writing that rarely, if ever, obscured its literary dimension." So, for a musically dedicated choral group like the Dunedin Consort, the real question is, Why not do Copland and Barber? Anyway, we get several works on the album for unaccompanied chorus, two from Copland and a few more from Barber, things getting under way with the appropriately named In the Beginning by Aaron Copland (1900-1990). Written in 1947, it's a choral motet with soprano soloist, inspired by the first chapter of Genesis from the King James Version of the Bible. Although it is probably not among Copland's most well-known works, many critics consider it among his best. Copland wanted the piece sung in a "gentle manner," which is exactly what director Ben Parry and his Consort do. Still, it's not so gentle that it excludes any life or liveliness. This is a vibrant, rhythmic, uplifting performance that commands respect and admiration from start to finish. 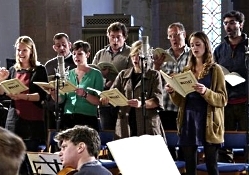 The Dunedin singers sound crisply articulate yet convey much feeling for the music. The soloist, Sally Bruce-Payne, sounds fresh and alert, with a beautiful vocal tone. In fact, everyone involved with this sixteen-minute production does an outstanding job, including Parry, who never rushes the music but lets it unfold naturally and comfortably. Next, we get Reincarnations, choral compositions for mixed chorus by Samuel Barber (1910-1981), a work he completed in 1940, followed by several other Barber songs. Reincarnations comprise three "contemporary madrigals," in this case English adaptations of early Irish poetry. Then, there are musical selections adapted from the writing of other British poets, including Gerard Manley Hopkins, concluding with Barber's 1967 choral arrangement of his own very popular Adagio for Strings, set to the words of the "Agnus Dei." Under Parry and his Consort, they sound expressive and Romantic, qualities Barber would exhibit throughout his musical life. Lastly, we find more of Copland's compositions, Four Motets, written early in the composer's career, 1921, during his student days. Copland wouldn't allow their publication until fifty years after he wrote them, saying, "Perhaps people want to know what I was doing as a student. The style is not really yet mine." Nevertheless, they are quite lovely, joyful and pleasing, and the Dunedin Consort performs them lovingly. Producer Ben Turner and producer-engineer Philip Hobbs recorded the music at Greyfriars Kirk, Edinburgh, UK in October 1999. Linn Records originally released the album in 2000 and rereleased it in 2014. Capturing the natural sound of the human voice, especially in chorus, is among the hardest things for a recording engineer to do. Often, vocals come off too bright, forward, hard, or edgy. Maybe that's OK for a pop album, where you simply want the soloist or backup singers to come across as clearly as possible, but it doesn't work as well for a classical album where listeners expect the sound to remind them of actual concert-hall experiences. 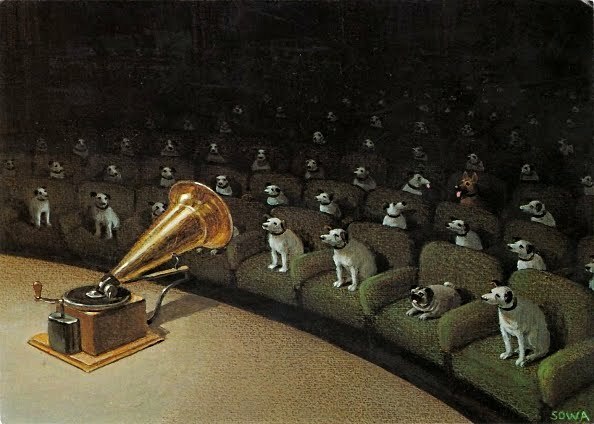 Moreover, listeners are probably more aware of what human voices sound like in reality than they are of musical instruments. So if the vocal tones aren't quite right, they become glaring inconsistencies in a recording. Happily, the folks at Linn get it mostly right. The voices, singly or in chorus, sound lifelike, smooth, rounded, yet detailed. There is not much brightness or edginess here except in a few of the loudest passages. A mild hall resonance adds to the accuracy of the presentation. On February 23 and 24, 2015, the pilot episode of composer Lisa Bielawa's serial opera Vireo: The Spiritual Biography of a Witch's Accuser will be videotaped at The Yost Theater in Santa Ana. Vireo is a new opera composed by Bielawa on a libretto by Erik Ehn and directed by Charlie Otte, which is unprecedented in that it is being created expressly for episodic release via broadcast and online media. Through a partnership with KCETLink, the national independent, non-profit digital and broadcast network, the unique multimedia initiative will include online articles and videos showcasing the production's creative process, as well as a television special presented by Artbound, KCETLink's Emmy award-winning arts and culture series. Vireo is an artist residency project of Grand Central Art Center (GCAC) in Santa Ana, an outgrowth of Cal State Fullerton, Director/Chief Curator John Spiak. Vireo's 25-minute pilot episode, to be taped in February for broadcast in spring 2015, will feature the Kronos Quartet, mezzo-soprano Laurie Rubin, the San Francisco Girls Chorus, the Orange County School of the Arts Middle School choir, mezzo-soprano Maria Lazarova, baritone Gregory Purnhagen, drummer Matthias Bossi, and in the title role of Vireo, 16-year-old soprano Rowen Sabala. It will be staged and filmed throughout the entirety of The Yost Theater, making use of the 650-seat capacity vaudeville theater's house, balconies, stage, lobby, and backstage areas. The taping will be open to the public. Information on how to make reservations will be announced in early January 2015. The taping of the pilot episode of Vireo is made possible in part with support from The Andy Warhol Foundation for the Visual Arts. Vireo: The Spiritual Biography of a Witch's Accuser is an opera that considers the nature and uses of female hysteria through time, as witch-hunters, early psychiatrists, and modern artists variously define the condition. 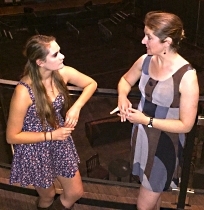 Based on composer Bielawa's own research at Yale as a Literature major, then freely adapted and re-imagined by librettist Ehn, Vireo is a composite history of the way in which teenage-girl visionaries' writings and rantings have been manipulated, incorporated, and interpreted by the communities of men surrounding them throughout history, from the European Dark Ages, to Salem Massachusettes, 19th-century France, the Surrealists in Paris, and contemporary performance art. Featuring arias for dying cows, infatuated students, disembodied ageless women, and a mysterious twin of Vireo herself, the opera provides a thoughtful, and sometimes humorous look at the universal issues of gender identity, perception, and reality. Innovating opera not only through content but through form, Vireo allows greater access of opera to a broader audience, through mainstream media and contemporary delivery systems. The piece considers authoritarian responses to independent, inspired imaginations, especially as they abide in young women. It scrutinizes the representation of women both in the historical form of opera and in modern media. The celebrated and ever-adventurous Del Sol String Quartet returns to NYC's Cornelia Street Café to perform a work from their latest album, along with other favorites from their formidable repertoire on Monday, January 12 at 9pm and 10pm. Reservations can be made by calling 212.989.9319. The American Bach Soloists (ABS) subscription season opens with an attractive pairing of masterworks by two musical giants. 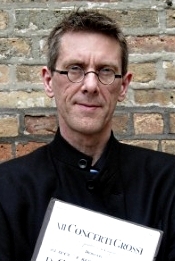 Jeffrey Thomas directs the renowned ABS orchestra in Bach's Brandenburg Concerto No. 4 in G Major, a tour de force for violino principale and two recorders. The balance of the program is devoted to Handel's pastoral masque, Acis and Galatea, composed in 1718 for the lavish private estate known as "Cannons," and revised two decades later for performances in London, Oxford, and Dublin. Full of buoyant, witty, charming melodies, it is one of the composer's most popular operatic works. Adapted from Ovid's Metamorphosis, the mythological tale of Acis and Galatea depicts how the shepherd, Acis, pursues a nymph Galatea against the advice of his cohort, Damon. The young lovers' delight angers the envious man-eating giant, Polyphemus, whose murderous actions are annulled by a magical transformation. From the joyful duet of "Happy we!" to Polyphemus's "I rage–I melt–I burn," the arias, ensembles, and choruses of Acis and Galatea convey a rich emotional journey within a relatively short drama. Oxingale Records, the trailblazing artists' label founded in 2000 by cellist Matt Haimovitz and composer Luna Pearl Woolf, is excited to announce that it is joining forces with PentaTone, the classical music label renowned for its discerning artistic quality and superior audiophile technology. Beginning in 2015, new albums and reissues from Haimovitz and his musical collaborators will be available internationally – in SACD 5.1 surround sound and as high definition downloads – from the Amsterdam-based label under the PentaTone Oxingale series. "Fifteen years ago, Luna and I founded Oxingale to pave a way for us to share music that we are passionate about, with an audience that we believed was seeking meaning and musical adventure," says Matt Haimovitz, continuing, "For us, classical music is a living, breathing art form. We started Oxingale to bring to life what has been in our minds and hearts, whether by composers working 300 years ago, newly inked works, or improvisations. The invitation to collaborate with PentaTone is an affirmation. With our shared sense of artistic and sonic values, we look forward to bringing our vision and energy to a label which has shown an optimistic and uncompromising attitude in its contributions to culture and the future of classical music." "There was never any doubt for PentaTone to join forces with Oxingale Records," says PentaTone's managing director, Dirk Jan Vink. "We believe the works of Oxingale artists bring a fantastic addition to our catalogue. With PentaTone's warm, dynamic and detailed sound capturing the superb works and performances of Oxingale's artists, we look forward to bringing you a range of prestigious work in prime quality." The new collaboration launches on February 1, 2015 with the release of "Beethoven, Period.," the complete collection of sonatas and variations for pianoforte and violoncello recorded on period instruments by Grammy-nominated cellist Matt Haimovitz and pianist Christopher O'Riley. Following later in the year are two more releases: Shuffle. Play. Listen, the groundbreaking recording, also with O'Riley, which saw Herrmann, Janacek and Stravinsky come together with Radiohead, the Cocteau Twins and John McLaughlin; and an all-Schubert album featuring the Arpeggione Sonata and the Cello Quintet. Also forthcoming is a 3-CD box set of Haimovitz's solo cello recordings from the last 15 years, including 20 world premiere recordings and two newly released tracks: "Orbit" by Philip Glass and a new arrangement of the Beatles' "Helter Skelter" for solo cello by Woolf. Founded in the year 2000, the Grammy Award-winning Oxingale Records is as committed to revelatory interpretations of the canonic repertoire as it is to riveting performances of works by recent and living composers. Under the new collaboration, Oxingale will continue to oversee its own A&R direction, while benefiting from the global distribution and marketing offered by PentaTone. Launched in 2010, Oxingale Music is the publishing arm of the label. Oxingale Music publishes the work of Luna Pearl Woolf plus a range of works by composers such as Pulitzer Prize-winner Lewis Spratlan and Rome Prize-winner David Sanford. The Oxingale Music catalog includes a substantial library of music written for and premiered by Matt Haimovitz, most of which are recorded on Oxingale and will be released over time as part of the PentaTone Oxingale Series. This year, Oxingale Music launched a semi-annual composition competition aimed at expanding and enriching the repertoire for cello in unusual combinations and ensembles. Over 40 composers from 18 countries entered the 2014 competition, the winners of which will have their works premiered in February 2015. Violinist David McCarroll made his concerto debut with the London Mozart Players in 2002, and has since performed with orchestras around the world. The Santa Rosa native appears alongside Roy Bogas, the acclaimed Principal Solo Pianist for the San Francisco Ballet. This matchless ensemble of dancers and musicians performs the Song of Eva Perón, a journey in dance and music through the life of the most important woman in Argentinian history. Formed in 1976, the Emerson String Quartet claims more than 30 recordings and nine Grammy Awards, including two for Best Classical Album. For their Weill Hall debut, the quartet performs a program of Mozart, Ravel and Beethoven. The unique sounds of the Nile Project are created by a stunning variety of instruments from Nile-basin countries, including: the mansenko from Ethopia; the ney and oud from Egypt; the adungu from Uganda; and six vocalists singing in 11 languages. Distinguished Concerts International of New York proudly presents "The Music of Karl Jenkins" featuring The Peacemakers and the U.S. premieres of The Healer and Llareggub. Sweden, Russia, Ireland, Italy, Canada and the U.S. Monday, January 19 at 7:00 pm--Martin Luther King Day--Stern Auditorium, Carnegie Hall, NYC. Distinguished Concerts International New York is proud to present its annual concert featuring the supremely beautiful and inspirational music of Karl Jenkins. One of the most prolific and frequently-performed composers in the world today, Jenkins continues to spread a musical message of peace and unity, impeccably encapsulated in his multi-lingual large-scale work, The Peacemakers, which draws texts from such luminaries as Mother Theresa, The Dalai Lama, and Gandhi, and is dedicated to the memory of all those who lost their lives during armed conflict. An international chorus – with outstanding ensembles from Germany, the United Kingdom, South Africa, Switzerland, Sweden, Russia, Ireland, Italy, Canada and the United States – unites to express this message of peace, with the Distinguished Concerts Orchestra under the baton of DCINY Artistic Director and Principal Conductor Jonathan Griffith, the recent winner of the prestigious American Prize in Conducting, in the professional orchestral division. The concert on Monday, January 19 at 7pm – Martin Luther King Day – at Carnegie Hall's Stern Auditorium, also features the U.S. premieres of Karl Jenkins' The Healer, a choral cantata for St. Luke, and Llareggub, a new work for orchestra. Karl Jenkins sums up the ethos of The Peacemakers with this 13th-century text by Rumi: "All religions, all singing one song: "Peace be with you." Drawing texts and inspiration from iconic figures that have shaped history, Jenkins includes evocative musical elements such as the bansuri (Indian flute) and tabla in the passages by Gandhi; the shakuhachi (a Japanese flute associated with Zen Buddhism) and temple bells in that of the Dalai Lama; African percussion in a section dedicated to Nelson Mandela; echoes of the blues of the deep American South, in his tribute to Martin Luther King; and uilleann pipes and bodhrán drums to accompany a Celtic prayer. Featured soloists include soprano Lucy Knight, baritone Mark Watson, violinist Jorge Ávila, Kara Deraad Santos, flutes; Rob Derke, soprano saxophone, and Carlo De Rosa, electric bass, of NYJAZZ; Benny Koonyevsky, ethnic percussion; and Joseph Mulvanerty, uilleann pipes. Llareggub, Jenkins's new orchestral work, is a quirky, surreal and whimsical snapshot of life in the fictional seaside village where Dylan Thomas set Under Milk Woods. The Welsh-sounding name betrays Dylan's sense of humor since, when written backwards, it means something else in English! The colorful piece is in three short movements: "Starless and Bible-Black," "Eli Jenkins' Prayer" and "At the Sailors' Arms." The Healer is a Cantata for St. Luke, an evangelist and physician of the soul. The text deals with healing, in both a spiritual sense, as well as the healing of our planet. 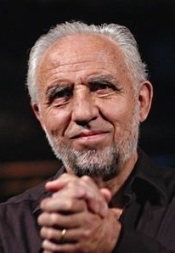 Along with parts of St. Luke's Gospel, the choral setting features extracts from the Book of Common Prayer, a poem by William Blake, and contributions especially written for this work by Terry Waite CBE, Vivien Harrison and Carol Barratt. In order to evoke the atmosphere and sound of the ancient holy land, Jenkins employs Middle Eastern percussion instruments, the riq and the darbuca. For more information about Distinguished Concerts International New York and upcoming DCINY musical events around the world, please visit: www.DCINY.org. Tickets: $20 - $100. Available at www.carnegiehall.org, by calling 212-247-7800, or at the Carnegie Hall Box Office (57th Street & 7th Avenue). Jeno Jando, piano. Naxos 8.573313. 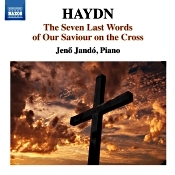 Austrian composer Joseph Haydn (1732-1809) wrote The Seven Last Words of Our Saviour on the Cross at the request of a priest to mark Good Friday, and Haydn published it in 1787. The title references the seven brief phrases spoken by Jesus on the cross, as the words appear in the four Gospels of the Bible. Along with an introduction and an "Earthquake" conclusion, they comprise nine movements, each slow, thoughtful, and reflective. But here's the thing: Haydn wrote the music initially as a meditation for orchestra, for listeners to hear as the Bishop descended from the pulpit to pray. Later, Haydn arranged the piece for string quartet and then as an oratorio for chorus and orchestra. More important for our present considerations, however, he approved an arrangement for keyboard, which Hungarian pianist Jeno Jando plays here. Jando has had considerable experience with the music of Haydn, Mozart, and Beethoven, having recorded all of the piano sonatas and many of the piano concertos of all three composers. His recording of The Seven Last Words does bear a certain stamp of authority. Now, I confess I am probably not the best person to judge Jando's performance because I have never heard the work done on piano; I have only heard the original orchestral version and the quartet arrangement, with a slight preference for the quartet sound. Moreover, by comparison to these other versions, Jando's interpretation and playing seem to me a tad more scholarly and a pinch less poignant. Nevertheless, I found Jando's handling of the piano version still has an abundance of charms. The Seven Last Words is one of those pieces that is at once highly spiritual--mystical and uplifting--and popular, too. That is, it appeals to those of a Christian religious persuasion and equally to the general public regardless of religious bent. For this reason, Jando emphasizes both the mysterious, transcendent qualities of the music as well as its more tuneful, lyrical, melodic aspects. Although Jando conveys an appropriately solemn tone, however, I still missed the warmer, lusher, more comforting sound of the orchestral and quartet versions of the piece. I suppose this is only natural for a person not used to the sparser, sparer sound of the single instrument. Yet even here, Jando uses the piano as well as possible to replicate the larger piece, especially in his treatment of contrasting tempos and dynamics, all the while communicating the music on a more-intimate scale. As I say, Jando's manner may appear somewhat academic as opposed to more red-blooded; still, there is no question his playing is graceful and elegant, with phrases cleanly laid out and affectionately communicated. Yes, the orchestral version in particular strikes me as more dramatic than Jando's realization, but one might expect that from the larger forces involved. Let's just say that Jando's rendering of the work is illuminating--lighter and in some ways maybe more introspective than the bigger-scaled productions. It's certainly worth a listen. Producer Ibolya Toth and engineer Janos Bohus recorded the music at Phoenix Studio, Diosd, Hungary in July 2013. The miking seems a little close, so we get an exceptionally clear piano sound; yet it's not so close as make the instrument appear ten or twelve feet wide. There is also a modest studio bloom that enhances the sound, making it resonantly rich and plush. Happily, perhaps because of the miking distance involved, the ambient room reverberation does not impart any undue softness to the sound, leaving it vibrant, full bodied, and pleasantly transparent. Gonzalo X Ruiz, baroque oboes; Monica Huggett, Portland Baroque Orchestra. Avie Records AV2324. Here's the thing: Nobody knows for sure if Johann Sebastian Bach (1685-1750) wrote any concertos for oboe; all original manuscripts are missing. But musical scholars believe that he probably did, later transcribing them for harpsichord. Thus, what we have on this disc are three concertos for oboe and one for oboe d'amore reconstructed from harpsichord concertos. Interesting: concertos reconstructed from what are probably transcriptions. I guess it's what makes musical scholarship so fascinating. 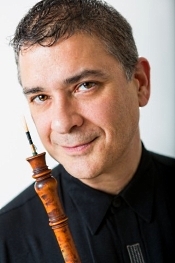 The star of the show is Gonzalo X. Ruiz, who is among America's premier period-instruments oboists. 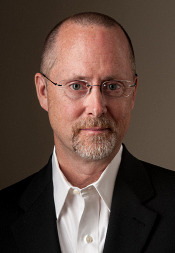 For the past twenty years he has been a member of the Portland Baroque Orchestra, and he has performed as principal soloist with most of the world's leading baroque orchestras, including Philharmonia Baroque, Ensemble Sonnerie, The English Concert, Orchestra of the Age of Enlightenment, and many others. He has made dozen of albums, been nominated for a Grammy, appeared just about everywhere, been appointed to the faculty of The Juilliard School, and taught at Oberline Conservatory, the Longy School, Yale, Harvard, and Indiana Universities. He's also an expert in reed design, and some of his work is on display at the Metropolitan Museum of Art. On the present album Ruiz appears as soloist with the Portland Baroque Orchestra and Monica Huggett, Artistic Director and First Violin. Things begin with the Concerto for oboe in G minor, BWV 1056R, a reconstruction of the Concerto in F minor for Harpsichord, BWV 1056. Next is the Concerto for oboe in F major, BWV 1053R, a reconstruction of the Concerto in E major for Harpsichord, BWV 1053. Then, we get the Concerto for oboe in D minor, BWV 1059R, a reconstruction based on a concerto fragment and Cantatas 35 and 156. The Portland Baroque Orchestra play at a lively pace, yet they never sound frenetic (as some "historically oriented" orchestras can sound). Tempos always appear well chosen for the music, with good spring in the rhythms and suitably judged contrasts throughout. Equally important, Ruiz's playing is smooth and graceful (note particularly the famous Adagio in 1059R), the oboe sounding surprisingly rich and mellow considering it's a period instrument. I was a little afraid it might sound coarse or raspy compared to a modern oboe, but not so. Perhaps Ruiz's mellifluous playing and his careful reed construction have a lot to do with the pleasing results. After those three items we come to the Concerto for oboe d'amore in A major, BWV 1055R, a reconstruction of the Concerto in A major for Harpsichord, BWV 1055. The oboe d'amore ("oboe of love") is a little larger than a standard oboe, its sound a little fuller and deeper. It conveys a sweetly romantic tone, especially in the slow Larghetto movement, with Ruiz nudging it along lovingly. The program's penultimate work is the real highlight of the show, the Concerto for Violin and oboe in C minor, BWV 1060R, a reconstruction of the Concerto in C minor for Two Harpsichords, BWV 1060. Here, Ms. Huggett joins Ruiz on violin. The interweaving of the two instruments is delightfully affecting, the violin taking the more active part in the fast first and third movements, the oboe handling the more lyrical accompaniment. The oboe comes into its own in the central Adagio, where Ruiz's playing is totally charming. The program ends with the little Aria from Cantata 51, transcribed for oboe. It offers a fitting conclusion, with Ruiz making the oboe sing in heavenly voice. Producers Thomas Cirillo, Gonzalo X. Ruiz, and Stephen Schultz and engineer Roderick Evenson recorded the music at St. Anne's Chapel, Marylhurst University, Marylhurst, Oregon in October 2013. 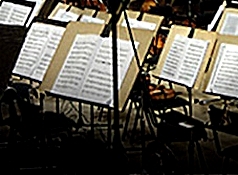 Various of the pieces use different instrumentation, some producing a fuller, more robust sound than others; but in every case the sonics are nicely spacious, warm, and open, the ambient environment of the recording venue pleasantly in evidence, yet without drowning out the orchestra in reverberation. Instead, the sound is fully dimensional, with a good sense of depth and breadth and plenty of air around the instruments. Detailing and definition also appear quite good, as do dynamics and frequency range. While the dynamics aren't exceptionally wide, they are appropriate to the occasion. This is a natural-sounding recording that makes listening a pleasure. Also, Grieg: Sonata for Violin and Piano No. 3; Dvorak: Romantic Pieces. 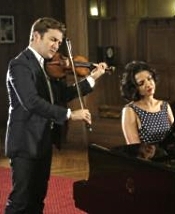 Renaud Capucon, violin; Khatia Buniatishvili, piano. Erato 08256 462501 8 9. 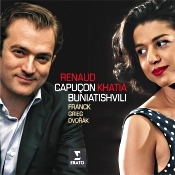 French violinist Renaud Capucon and Georgian pianist Khatia Buniatishvili are two relatively young and enormously talented musicians who make beautiful music together on this disc of violin sonatas from Franck, Grieg, and Dvorak. It's really quite a lovely album, the partnership of the two players producing some delightful results. Things begin with the Sonata for Violin and Piano in A major by French composer, pianist, and organist Cesar Franck (1822-1890). Franck wrote the Sonata in his later years, 1886, dedicating it to his friend, violinist Eugene Ysaye, as a wedding gift. The four movements of the piece follow a slow-fast-slow-fast structure, with the slow sections the most memorable for me. They are sublime, and Capucon's solos are wonderfully lyrical and soaring. Ms. Buniatishvili's accompaniment, especially in the faster segments, is virtuosic, too, and they make the music come alive in contrasting contemplative and vigorous moods. Beautifully done. Next up is the Sonata for Violin and Piano No. 3 in C minor by Norwegian composer and pianist Edvard Grieg (1843-1907). He wrote it in 1887, some twenty years after writing his first two violin sonatas. It would be his last completed chamber work. Flawless intonation from Capucon and nuanced passage work from Buniatishvili highlight the work. After the peace and serenity of the opening Franck music, the Grieg sounds more dramatic, at least in the beginning. In fact, it's almost startlingly dramatic at this point, with the performers playing up the difference for all it's worth. But then they settle into Grieg's more sensitive and melodic material, and the music takes a daring turn into the rhapsodic. The second of the three movements is most songlike, with the violin singing its part in spirited fashion. The soloists take turns expressing the work's varied passions, the finale sounding as close to a traditional folk melody as Grieg would get. The final item on the program is the four-movement suite called Romantic Pieces, written in 1887 by Czech composer Antonin Dvorak (1841-1904). Dvorak's four little compositions sound sweetly evocative under the guidance of Capucon and Buniatishvili, who again work wonderfully together, complementing each other's every note. Again I found the slower movements most to my liking, the performers infusing the music with a sublime attractiveness that is downright impossible to resist. Producer Michael Fine and engineer Jin Choi recorded the album at Auditorium Campra, Conservatoire Darius Milhaud, Aix-en-Provence, France in April 2014. The two performers are playing on a large stage, miked at a moderate distance. The space is just enough to provide a strong presentation with good detail yet admit a pleasant degree of reflective hall ambience as well. The sound is smooth, warm, resonant, and mildly rounded, both artists showing to advantage in a natural-sounding acoustic. JACK Quartet, Del Sol String Quartet, PUBLIQuartet and conductor Delta David Gier join the American Modern Ensemble for an unforgettable evening of world premieres from Jacob Bancks, Sidney Boquiren and Robert Paterson and modern masterpieces by Chinary Ung, Jessie Montgomery, John Zorn and John Luther Adams. This all-star string summit will culminate with all groups performing together with Maestro Gier at the helm. Now in its 10th season, American Modern Ensemble hosts a top-notch line-up of performers for "String Theory" at SubCulture (45 Bleeker Street, NYC) on Thursday, January 15, 2015 at 7:30pm (doors open at 6:30pm). The concert marks AME's first event at SubCulture, its hip new home on Bleecker Street. To mark the occasion, three trailblazing string quartets—NYC indie outfits JACK Quartet and PUBLIQuartet and the worldly San Francisco-based Del Sol String Quartet—plus the intrepid American conductor Delta David Gier join forces with AME's stellar players for three world premieres and a fresh live take on the listening party format, with each guest ensemble selecting and performing one of its signature contemporary pieces. Compelling themes including drug trafficking, murder, love and friendship, and shame and self- isolation lie at the heart of these fascinating contemporary works. Fort Worth Opera (FWOpera) announced today the names of the eight composer and librettist teams whose unpublished works have been selected for the company's third annual, critically-acclaimed new works series, Frontiers. Held during the final week of the 2015 FWOpera Festival, these selected pieces will be presented in two separate showcases of four works each on Thursday, May 7 from 6:00pm – 8:00pm, and Friday, May 8 from 6:00pm – 8:00pm, in the intimate Kahn auditorium of the Kimbell Art Museum. Featuring 20-minute excerpts of each selected piece, these brand-new operas will be sung by artists from the 2015 FWOpera Festival with piano accompaniment. Tickets for the showcases are $10 each, and can be ordered by calling FWOpera's Customer Service team at 877.396.7372. Now entering its third season, Frontiers continues on its mission of seeking out works for future production in FWOpera's alternative venue series Opera Unbound. The program includes a distinguished panel of collaborative partners who will play a critical role in the long-term development of the Frontiers works beyond the Festival showcase, (panel members listed below), and all selected composer and librettist teams will take part in one-on-one, closed feedback sessions with the panelists during the workshop to help them strengthen and develop their pieces. In announcing this year's Frontiers participants, Fort Worth Opera General Director Darren K. Woods, chair of the Frontiers panel, stated, "In only two years, Frontiers has exceeded our greatest expectations of seeking out the finest up-and-coming composers and helping to foster their works. Selections from the first two Frontiers seasons have gone on to additional workshops where they continue to be fine tuned while others have received their professional debuts at prestigious companies in the U.S. This is an exciting time for opera, and we're looking forward to bringing eight new, gripping works to our audiences, while also helping their creators find subsequent homes for these extraordinary pieces." Orbert Davis's Chicago Jazz Philharmonic celebrates NEA jazz master Gunther Schuller and Third Stream music Feb. 6. Featuring a wrld premiere commission by Daniel Schnyder. The Chicago Jazz Philharmonic (CJP), under the direction of Artistic Director Orbert Davis, presents "The Godfather of Third Stream: Gunther Schuller" on February 6, 2015 at Symphony Center, 220 S. Michigan Avenue, Chicago. This project is an homage to composer, educator and NEA Jazz Master Gunther Schuller, who coined the term "Third Stream" in 1957 to describe music that combines jazz and classical techniques. 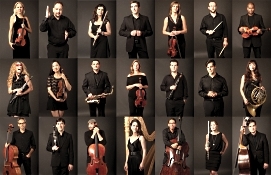 "As part of our year-long 10th year anniversary celebration, this project supports the season's overall artistic goal of highlighting the depth and breadth of the orchestra's repertoire and also promoting Third Stream, a signature component of the CJP aesthetic," commented CJP Executive Director Birdie Soti. Repertoire for "The Godfather of Third Stream: Gunther Schuller" traces the music of Third Stream from 1957 to present day, including works by the late William Russo, artistic director of Columbia College Chicago's Chicago Jazz Ensemble and a close mentor of Orbert Davis. The program highlight is the CJP's first-ever commission: a new work by Daniel Schnyder, a Grammy-nominated composer/performer with a dynamic reputation in both jazz and classical genres. Veterans, students and teachers are enjoying free tickets to a variety of events at Scottsdale Center for the Performing Arts thanks to the generosity of Tiffany & Bosco, P.A. and Great American Title Agency, Inc. The Center, which is operated for the City of Scottsdale by the nonprofit Scottsdale Cultural Council, has been offering complimentary tickets to veterans for several years and has since expanded the popular initiative to include students and, most recently, teachers. Tiffany & Bosco, P.A. and Great American Title Agency, Inc. became the program's first official sponsor for the Center's 2014–15 season. "The arts inspire, entertain and educate every one of us," remarked attorney Mark S. Bosco of Tiffany & Bosco, P.A. "We're pleased to support the Scottsdale Center for the Performing Arts and to help provide shared arts experiences for our veterans, students and teachers." Bruce Beverly, CEO of Great American Title Agency, Inc. and a member of the Scottsdale Center for the Performing Arts advisory board, added, "The Center's commitment to excellence and service to the community are values that we share at Great American Title. I have an interest in the arts and joined the advisory board of the Center to support its mission and programs." During its 2013-14 season, Scottsdale Center for the Performing Arts donated nearly 3,000 free tickets valued at $96,000 to veterans and students. Many of the tickets for veterans are provided through the Phoenix-based Veteran Tickets Foundation (www.VetTix.org). In recent years, the Center has contributed a total of more than $250,000 in tickets to the nonprofit charity, which distributes them to veterans and their families. "Providing access to the arts is at the heart of our organization's mission," noted Scottsdale Cultural Council President and CEO Neale Perl. "We're grateful to Tiffany & Bosco, P.A. and Great American Title Agency, Inc. for their sponsorship of this wonderful program." Both active-duty and retired veterans are eligible to receive free tickets to selected events, which are regularly offered through www.VetTix.org as well as the Scottsdale Center for the Performing Arts box office. When requesting their tickets directly from the Center, veterans just need to show their military ID or proof of service. Students and teachers from any grade level – kindergarten to college – may request one free ticket each to selected events through the box office using their current school ID. A list of eligible events is updated throughout the season and features dance, music and theater, including the Close Encounters With Music and ASU Concerts at the Center series. Tickets are limited, and additional information is available at 480-499-TKTS (8587) or visit www.ScottsdalePerformingArts.org/visit/tickets-discounts/. Monday, December 22 at 8:00 p.m. – NEW DATE! *Admission includes a post-concert wine and jazz reception. Celebrate the season of giving and sharing with One World's very first reality TV-inspired Operasode: Bachelor! Ladies will vie for the heart of our eligible bachelor, Sergey Prokofyev (seriously! ), through comedy, song and dance. Who will Sergey choose: tap dancer, a darling orphan with sparkling high notes, the killer seductress or one of Time Out NY's Top 10 Funniest Women? Girl drama, cat fights, love at first sight, or a marriage proposal in One World's presentation of the rose? Net proceeds from the concert benefit New York City's largest soup kitchen, Holy Apostles Soup Kitchen, while One World Symphony and the Bob Page Jazz Trio give you a break from a holiday madness. Ticket includes invitation to a post-concert wine and jazz reception. We head into 2015 as Orchestra in Residence at the most important music festival in Colombia, the Cartagena International Music Festival. During the two-week stay, the MCO plays a total of eight concerts, with Teodor Currentzis, Alexander Melnikov and Pekka Kuusisto among others. Violist Florent Bremond reports on the highly successful last tour of the year, which brought the MCO with Leif Ove Andsnes to Lucerne, Vienna and Brussels. His conclusion: "This was intense – I can hardly imagine how the next three tours will keep pushing our artistic quest even higher. But I am sure Leif Ove already has his ideas about it..."
Also, Loussier: Nympheas. Jacques Loussier Trio. FIM LIM UHD 079 LE. Quick: Is it classical jazz or jazzy classical? That's the question listeners have been asking of the Jacques Loussier Trio for the past fifty-odd years. Loussier and his jazzmen have been bringing us their renditions of popular classical tunes for a long time. Combining classical and jazz in really good recordings, they have also long been an audiophile's delight. The jazz ensemble has done Bach, Beethoven, Chopin, Debussy, Handel, Mozart, Ravel, Satie, Vivaldi, Schumann, you name it, and they've sold a ton of albums over the years. If you like what they do, this is another album that will please their fans, the disc sounding better than ever in its new remastering. 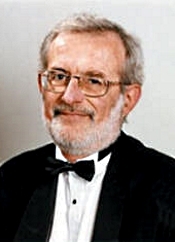 Pianist Jacques Loussier has worked with several different trio partners in his time. The present album lists the lineup here as Loussier on piano, Benoit Dunoyer de Segonzac on bass, and Andre Arpino on drums. 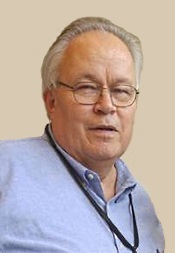 Loussier made the Bolero album for Telarc in 1999, and FIM (First Impression Music) and LIM (Lasting Impression Music) remastered it to audiophile standards in 2014 using their UltraHD and PureFlection technologies. With a warhorse like Bolero and a coupling of Loussier's own creation, though, this one may be toss-up for many listeners. But, then, there's the sound, about which there is little question: Audiophiles may want it for demo purposes alone. Anyway, the program begins with a jazzy take on Bolero by French composer Maurice Ravel (1875-1937). After initially writing a part of it for piano, the composer asked a friend asked to listen to it, saying "Don't you think this theme has an insistent quality? I'm going to try and repeat it a number of times without any development, gradually increasing the orchestra as best I can." Most recordings of it last between twelve and eighteen minutes, the score indicating a Tempo di Bolero, moderato assai ("tempo of a bolero, very moderate"), and the composer preferred it taken fairly slow and steady. In a 1931 interview with The Daily Telegraph, Ravel went so far as to say the piece lasts seventeen minutes. He would even criticize conductors (like Toscanini) who took it too fast or conductors who sped up toward the end. I mention this because Loussier and his pals take it at just a few seconds over seventeen minutes. Not that Loussier's rendition actually sounds a lot like the orchestral version Ravel envisioned or even the solo or two-piano arrangements of it. Still, that's OK; Bolero apparently has more uses in it than a Swiss Army Knife. 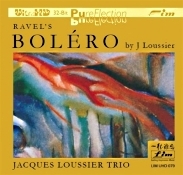 Loussier's arrangement maintains Ravel's rhythms while seemingly improvising on the melody in new and, well, jazzy ways. So, yes, you still get the full flavor of Ravel's familiar number, and you get an all-new jazz rendering of it thrown in, with the cymbal and later the snare drum leading the way. It's like two for the price of one: Buy one, get one free. Remarkably, it's all highly musical and eminently listenable as well, thanks to the expert musicianship of the players. Coupled with Bolero is a seven-movement piece called Nympheas ("Water Lilies"), composed by Loussier himself. Loussier based the music on paintings by the French impressionist Claude Monet depicting Monet's flower garden at Giverny. It's important that the colors of the music at least somewhat remind us of the colors and nuances of the impressionistic paintings. I found Loussier's Nympheas even the more compelling than his Bolero, perhaps because as good as Loussier's Bolero is, I've already heard it done enough different times in enough different ways to last a lifetime. With Nympheas we get a rich assortment of graceful lines, gentle beauty, and refreshing energy. The movements alternate a contemplative tranquility with a lively power, producing some fascinating and wholly engrossing results. As usual for FIM/LIM, the disc comes packaged in a glossy, hard-cardboard fold-over case, the disc itself housed in a static-proof inner jacket, further enclosed in a bound paper sleeve, along with a twelve-page set of notes, text, and pictures. 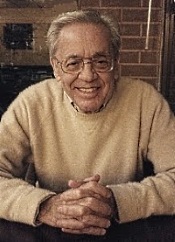 Jacques Loussier and his ensemble originally recorded the album in 1998 for Telarc Records at Studio Grande Armee, Palais des Congre's, Paris. FIM/LIM producer Winston Ma and Five/Four Productions engineer Robert Friedrich remastered the album in 32-bit Ultra High Definition and PureFlection replication processing. The clarity and definition on this disc are a joy to hear. Highs sound extremely well extended, clear and vibrant. Lows are appropriately robust. And midrange transparency is exemplary. Moreover, transient response is quick, the dynamic impact is solid, and the ambient hall resonance is lifelike. In essence, you have three musicians in the room with you, piano center, percussion right, bass very slightly left. Yet the stereo spread is not so great as to exaggerate the players' positions. They appear, in fact, well clustered between the speakers. As far as concerns FIM/LIM's remastering, the sound is clearer and more dynamic than ever, the aforementioned transparency all the more evident. Also, Clarinet Concerto; Quiet City; Three Latin-American Sketches. Laura Arden, clarinet; Paul Gambill, Nashville Chamber Orchestra. Naxos 8.559069. It must be something in the air in Nashville. A month or so before reviewing this disc about a decade ago, I sat down and listened to one of the most lively and sparkling renditions of West Side Story I'd ever heard, done by the Nashville Symphony Orchestra. Then I listened to the present Nashville recording, one of the best compilations of music by Aaron Copland (1900-1990) around, this time done by the Nashville Chamber Orchestra. I don't know what's going on in Nashville, but I hope Naxos continues to record there for a while. 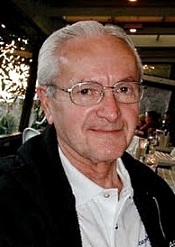 Maestro Paul Gambill's collection of Copland material with the Nashville ensemble focuses on the more contemplative side of the composer, although it opens with three short Latin-American Sketches (1972) that are quite colorful and done up in lively style. The main things, though, start with the Clarinet Concerto (1950), written expressly for Benny Goodman, who subsequently admitted he was afraid to play it, fearing he wasn't up to doing it justice; but he did play and record it, frequently. The piece takes up first in a surprisingly but beautifully melancholy, romantic mood and then lightens up, becomes playful and jazzy, and finally turns slightly Latin in mood. Gambill has the measure of it, and clarinetist Laura Arden is a charmer. Copland wrote Quiet City (1940) for a play that never opened, but the composer salvaged a suite from it that in this recording sounds deeply felt, reflective of silent streets and hushed nighttimes in the city, apparently a period of day about which Copland had strong ties. Gambill and his players capture the mood nicely. 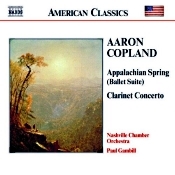 Then, the album ends with the composer's suite from the ballet Appalachian Spring (1944), where Copland's own notion of Americana meets the old Quaker tune "Simple Gifts." Interestingly, the booklet note says that it was Appalachian Spring "that made Copland the first American composer to win global recognition and popularity." I guess Gershwin didn't count, or Gottschalk or Joplin or Coleridge-Taylor or Chadwick or Sousa or MacDowell or Beach or Herbert or Ives or.... Whatever, Maestro Gambill handles the piece with an appropriate sweetness and repose. The Nashville Chamber Orchestra plays all of this with faultless skill, if perhaps not doing it quite as deftly as Copland himself or Bernstein did in their Sony (Columbia) recordings or Tilson Thomas on RCA. Certainly, however, the Nashville ensemble plays with just as much sensitivity and enthusiasm, and that counts for a lot. The recording, which Naxos released in 2002, sounds superbly balanced, the frequency range understandably not reaching down too far as these are essentially chamber pieces, after all. The clarity, left-to-right imaging, and overall tone of the sound, however, appear on a par with the best recordings the folks at Naxos have ever provided us. With over an hour of genuinely classic and classy music presented by a classy orchestra in classy sonics, the disc seems inspired. Garry Clarke, Baroque Band. Cedille Records CDR 90000 152. Maurice Greene. Maurice who? Maurice Greene. Oh. 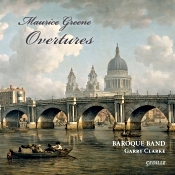 Some of you may recognize the name of the English composer and organist Dr. Maurice Greene (1696-1755). I did not. I had to dig into the disc's booklet notes to find out more about him. Turns out, according to conductor Garry Clarke who wrote the notes, "he was one of the most important figures in English musical history in the 18th century. Yet he is little known today and his instrumental pieces are rarely performed." Indeed, I can attest to that. Greene became organist at the Chapel Royal in 1727 and Professor of Music at Cambridge University in 1730. Then, in 1735 the Crown appointed him Master of the King's Musick. So, yes, he was an important guy back when. Mostly, Greene composed choral music, verse anthems, oratorios, operas, and some keyboard music. Here, we get some of instrumental music, his Six Overtures in Seven Parts, written originally in 1745 in an arrangement "for harpsichord or spinet" and first published in 1750. Clarke tells us that they display a quintessential Englishness while recognizing the 'new' Italian style being imported" at the time. He further tells us "the overtures are charming and delightful, with whistleable melodies, easy harmony, and inventive counterpoint. They conjure up the charm of the English countryside and the frivolity of the English 18th century." Certainly, Maestro Clarke and his ensemble, the Baroque Band, which he founded in 2007, do their best to conjure up delights. And they do so in a most elegant fashion. This is no Raggedy-Annie period orchestra but a rich, polished, finely tuned group of performers. In fact, if anything, they may appear too polished compared to some of the historically informed groups we've gotten used to over the last half century or so. Still, they are a joy to hear, and they do bring the music to life with liveliness and gusto. The overtures, of course, are not really "overtures" as we think of them today; that is, they are not introductions to something else, as in opera overtures. Instead, these are Baroque overtures: miniature suites alternating fast and slow movements (in this case, three or four movements each). However, one could view the little opening movements as opera overtures in themselves, and they contain a good deal of buoyant charm. Probably the most important aspect of Clarke's performances with Baroque Band, besides the enthusiastically elegant playing I alluded to earlier, is their ability to keep one listening. OK, much of this latter quality we have to attribute to the composer and his music, but you also know that Baroque music can sometimes become a bit wearying if there's too much of it repeated at the same time. I mean, no one is sure about just how the composer intended people to listen to his overtures: all at once or one or two at a time. I worried that I might find listening to all six at the same time something of a chore, my not being a dedicated Baroque fan. Nevertheless, every overture is significantly different from the others, some sounding like Bach, some like Handel or Vivaldi, but mostly sounding like Greene. So listening to them all at once (with only a brief break toward the middle for a quick snack) proved more fun, at least the way Clarke and company present them, than I anticipated. In addition to the overtures, there are five more, very brief items: Pieces in C minor, A minor, and G minor from Lessons for the Harpsichord, and overtures to Phoebe and St. Cecilia. They are all lovely in their own way, with my own delight going out for the harpsichord. Producer Jim Ginsburg and ace engineer Bill Maylone recorded the overtures in 2010-2014 at Nichols Hall at the Music Institute of Chicago, Evanston, Illinois; at College Church, Wheaton, Illinois; and at Fay and Daniel Levin Performance Studio at 98.7 WFMT, Chicago, Illinois. To my ears, the sound is a trifle bright in the upper midrange, but it's extremely clear and well detailed. And for all I know, this slight forwardness may be exactly what the ensemble sounded like in the particular recording venues represented. In any case, played back at a realistic level, there is a wide stereo spread to the sound, good depth and dimensionality, a quick transient response, and pretty good frequency extension. A modest hall resonance adds a further degree of realism to the presentation. Also, Schumann: Symphonic Études. Valentina Lisitsa, piano. Decca 478 7697. Once a teacher, always a teacher: I cannot help but begin this review with a definition of "étude," since that's what we've got here from Chopin and Schumann, and not everyone may understand what they are. My WordWeb dictionary tells us an étude is "a short composition for a solo instrument; intended as an exercise or to demonstrate technical virtuosity." Wikipedia takes it a step further, saying it's "a French word meaning study, an instrumental musical composition, usually short, of considerable difficulty, and designed to provide practice material for perfecting a particular musical skill. The tradition of writing études emerged in the early 19th century with the rapidly growing popularity of the piano." Frederic Chopin (1810-1849) composed two sets of études, Op. 10 (1833) and Op. 25 (1837). They were probably the first such sets of études to gain a reputation in the piano repertory, and virtuoso pianists continue to play them today. They were quite unique for their time, and, certainly, they are not easy to play. Franz Liszt, to whom Chopin dedicated the Op. 10 études, was among the first pianists to play them successfully, and they've been giving pianists a hard time ever since. Not even the great Chopin interpreter Arthur Rubinstein thought his performances of them good enough to record in their entirety. Which brings us to Ukrainian-born pianist Valentina Lisitsa, who makes Chopin's études look easy. Ms. Lisitsa launched her career via social media a few years back with YouTube videos that became quite the rave of the music world. These days, she's been working a lot with violinist Hilary Hahn and recording for one of the biggest and oldest record companies in the world, Decca, so obviously talent will out. Her Chopin études are among the finest I've heard. Yet taste differs, and other listeners may find her manner too precise, relying more on technical skill and less on heart. 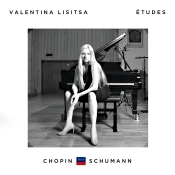 Whatever, the Chopin fan may want to sample Lisitsa's études. Ms. Lisitsa's playing is a marvel of exactness, and she swirls through the finger work with a commanding ease. Yet there is much elegance and refinement in her interpretations as well. If I had any minor reservation, it's that she does take some of these little études at a quicker pace than most other pianists do. While this leads to some thrilling moments, to be sure, some jaw-dropping dazzle, I'm not sure it expresses all of the softer, inner emotions these pieces have to offer. As I say minor; Ms. Lisitsa's showmanship should easily carry the day and win over most listeners. Favorites? To be honest, even though I love Chopin, the études are not among my favorite Chopin works. Nevertheless, for me, the highlights of Ms. Lisitsa's disc include Nos. 1, 3, 6, 11, and 12 in Op. 10, all of them models of culture and sophistication; and Nos. 1, 2, 8, 9, and 11 of Op. 25 for their thoughtfulness and lyrical beauty. But, then, these are, as I say, just personal favorites that Ms. Lisitsa carries off with consummate ease. In addition to Chopin's two sets of études, we get the Symphonic Études, Op. 13, including the five supplementary variations, of Robert Schumann (1810-1856). Schumann's études are even briefer than Chopin's, most of them lasting no more than a minute or so each, but they are no less difficult. As tests of a pianist's virtuosic skills, Schumann's pieces work perfectly. Yet it isn't easy to make each stand on its own merits. Ms. Lisitsa does a splendid job individualizing the works and investing each of them with an appropriate zest and vigor. No disappointments here, either. I suppose when it comes down to it, one has to decide how many versions of Chopin's or Schumann's études one needs and whether Ms. Lisitsa's renditions are enough better or enough different than all the rest to warrant a purchase. After all, there are already fine recordings from Pollini (DG), Perahia (Sony), Andsnes (Virgin), Ashkenazy (Decca), Lugansky (Naxos), and others available, some of which one probably already has. I can only tell you that Ms. Lisitsa's performances and Decca's sound would not be out of place among the best of them. Producer, engineer, and tape editor Andrew Mellor recorded the music at the Reitstadel, Neumarkt, Germany in June 2014. The sound captures the piano pretty accurately, with a modest distance involved. It's clear and clean, a trifle hard in the upper registers but probably accurate. I'd say it's the kind of sound that reflects well the precision of Ms. Lisitsa's style. Incidentally, the running time of the album is a little over eighty-five minutes, which may be some kind of record for compact discs. I've been collecting and reviewing CD's since the early Eighties when Sony and Philips jointly introduced them in the U.S., and I don't think I've ever found one until now with a playing time as long as this disc. Remarkable. Submissions opened December 1, 2014 and end on January 31, 2015. Eligible entrants must be 30 years old or younger and currently studying composition either at an institution or through private instruction. There is no entry fee to submit. "It is difficult for any composer to hear their orchestral works played by a professional ensemble, and especially so for students. One of our goals with this year's Competition is to help talented students who might not have access to these resources at their schools get that valuable hands-on experience," says PARMA CEO Bob Lord. "We want the orchestral format to continue to be a viable one for composers of the future." A full list of guidelines is available at www.parmarecordings.com/studentcomposercompetition. For more information about PrimaVista please visit www.parmarecordings.com/primavista. For all inquiries and questions please contact press@parmarecordings.com. Only New York solo recital this season. On Saturday, December 13, Met Music Director James Levine led the first HD performance of Wagner's grand comedy Die Meistersinger von Nurnberg, broadcast live in HD to local movie theaters. An encore presentation of this performance will be exhibited in select movie theaters on Wednesday, December 17, 2014 at 6:30 p.m. in all time zones. It was announced recently that the Seattle Symphony has received six nominations in the classical category for the 2015 Grammy Awards. Seattle Symphony Media Recording Engineer Dmitriy Lipay was nominated for Producer of the Year. The Foundation to Assist Young Musicians family cordially invites you to attend the Holiday Recital for the Violins for Kids project. We've got a lot to be thankful for! At this recital we want to thank all those who have supported FAYM since its founding seven years ago and our "Violins for Kids" project for the past five years! Please come and be recognized! Give the gift of music. Contribute Today! All performances in Grace Cathedral, 1100 California St., San Francisco.